(APN) DEKALB COUNTY — The November 2015 referendum vote over whether to create a new city in DeKalb County called LaVista Hills failed by a vote of 6,925 nays to 6,789 yeas, a difference of 136 votes. 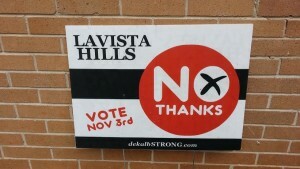 Early on Election Day, some voters in the proposed City of LaVista Hills did not see the cityhood referendum on their ballot and initially were not allowed to vote, as earlier reported by Atlanta Progressive News. The haphazard way the boundary lines are drawn did cause initial confusion on election day. Maxine Daniels, Director of DeKalb County Elections, said her workers found forty voters who’d been mistakenly excluded from voting in LaVista Hills, but that mistake was quickly corrected. The LaVista Hills boundary lines cut neighborhoods in half and people living on one side of a street were drawn into the proposed LaVista Hills, while neighbors on the other side remained either way in unincorporated DeKalb County. Leonard Piazza, an election supervisor, alleged he found an unsecured memory card loose in the office that contained results from Briarlake Elementary precinct, according to the Atlanta Journal-Constitution. It is not known if the votes on that card were counted in the precinct’s totals. The Secretary of State’s office is alleging fraud and criminal activity in the LaVista Hills vote and has opened an investigation. The Georgia Bureau of Investigations has removed voting equipment, computers, and memory cards from DeKalb County Registration and Elections Office headquarters at 4380 Memorial Drive. Georgia’s Secretary of State, Brian Kemp, last year accused the New Georgia Project of fraud that others called an attempt at voter suppression of minority votes by the SOS. The expensive investigation turn up next to nothing. LaVista Hills Alliance Chairwoman Mary Kay Woodworth had previously said in a statement that they had retained legal counsel to explore a possible challenge to the validity of the November 03 vote. Woodworth alleged a multitude of complaints and said her group was swamped with complaints from voters. The LaVista Hills Alliance issued a press release saying they evaluated the matter and because of the cost involved they decided that they would not pursue the legal challenge. They had previously urged voters to contact them via their Factbook, website, or phone number with information to aid them in the investigation. However, APN tried to access those avenues and they are no longer available. LaVista Hills Alliance and LaVista Hills Yes were two different groups that promoted cityhood. “We have some differences in our approach,” Allen Venet with LaVista Hills Yes told APN. State Rep. Mary Margaret Oliver (D-Decatur) sent out a statement with her thoughts on the controversy. Oliver does not think the November 03 election could be overturned based on the limited facts. The recounts resulted in three more “no” votes, now totaling 139. Most of the voters in Oliver’s 82nd House District voted no at a higher rate than the overall no vote. There was too much division between the neighborhoods, some strongly for and some strongly against a new city, she observed. “The LaVista Hills cityhood election was based on too many negative messages. There needs to be more buy-in before new campaigns are initiated,” Oliver stated.